I’ve had this idea in my head for a while now. I’m not reinventing food, I’m not improving, I’m just putting a little twist on it. I’m notorious of doing redux recipes of Cambodian classics, I draw inspiration from my surroundings and Californian upbringing while still (hopefully) keeping true to Cambodian flavors. Cambodian-Californian is what I’ve nicknamed my whimsical cooking style. I’m horrible at blogging and even worse at taking pictures, so I haven’t really showed my talents very well on this blog. I look back at my old pictures and I cringe inwardly, but it’s a growing experience and I’m showing promising progress! 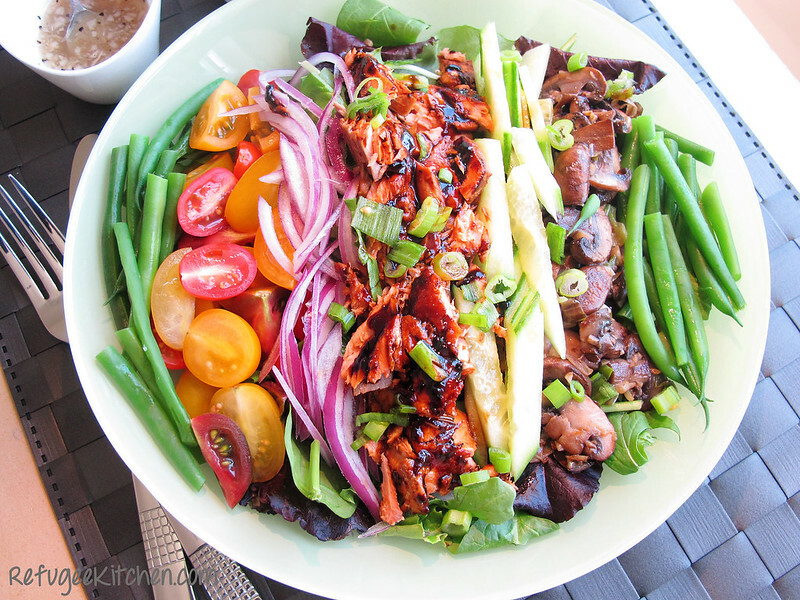 A few days ago I made Lok Lak, a Cambodian hot beef salad, taking the root flavors of it, the fresh vegetables, along with the beautifully thick sauce, I played around and made something that looks different but still has that taste I love so much in Lok Lak. I went organic personally but the choice is up to you! Organic salad mix, organic mini heirloom tomatoes, organic cucumbers, red onions, organic hericot verts (cooked til tender crisp), sautéed crimini mushrooms and wild sock-eyed salmon that’s been brushed with a Mushroom Soy reduction and broiled lightly. Served with Tuk Meric (lime black pepper sauce) and more Mushroom Soy reduction. My father was very amused when I presented it to him for lunch this past Saturday. Very amused as in he ate it reluctantly at first but consented that it was delicious, my father is not a salad guy. He’s a rice, meat and burgers kinda man, except my mother is doing away with his burgers and limiting his meat intake. She’s trying to convince him that it’ll make him live longer, except I’m an enable and a Daddy’s Girl, I sneak him bacon cheeseburgers on request. Luckily the rest of my household wasn’t so hesitant and dug right in, the Mushroom Soy reduction made it taste like a raw stir-fry, which was the most surprising aspect to me, I felt like I was eating the freshest and crunchiest stir fry ever and no rice needed. I dig it! 1. Cook hericot verts in salted boiling water until tender crisp, about 1 min, remove and place in an ice water bath to stop the cooking. Drain after it’s well chilled, set aside. 2. Over medium high heat, heat saute pan with 2 tbsp oil. Add crimini mushrooms and saute until lightly brown. 3. Add garlic and whites of scallions, continue to saute until garlic is fragrant, about 2 mins. Set aside. Man I love the smell of cooked garlic, it never ceases to make my mouth water! 4. Make Lime Pepper Sauce, mixing to dissolve sugar, set aside. 6. In a small sauce pan, mix mushroom soy, oyster sauce, sugar, chili garlic sauce (optional) and bring to a light boil. Dissolve corn starch in 1/2 cup water and add to pan, bring to a boil and allow to reduce and thicken, about 2-3 mins. Turn heat off. 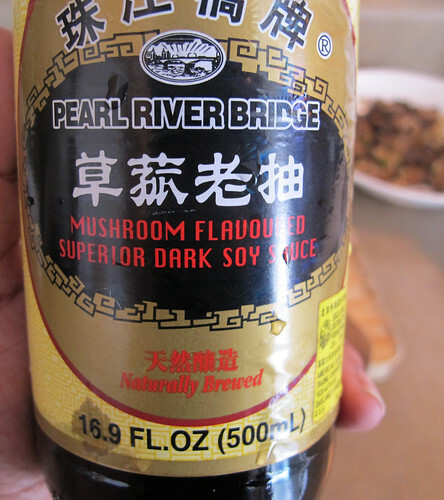 Have you ever tried mushroom soy? It’s super delicious, pick up a bottle! 7. Lightly brush salmon with oil followed by liberally brushing on Mushroom Soy reduction. Place in oven and broil for 3-4 mins. 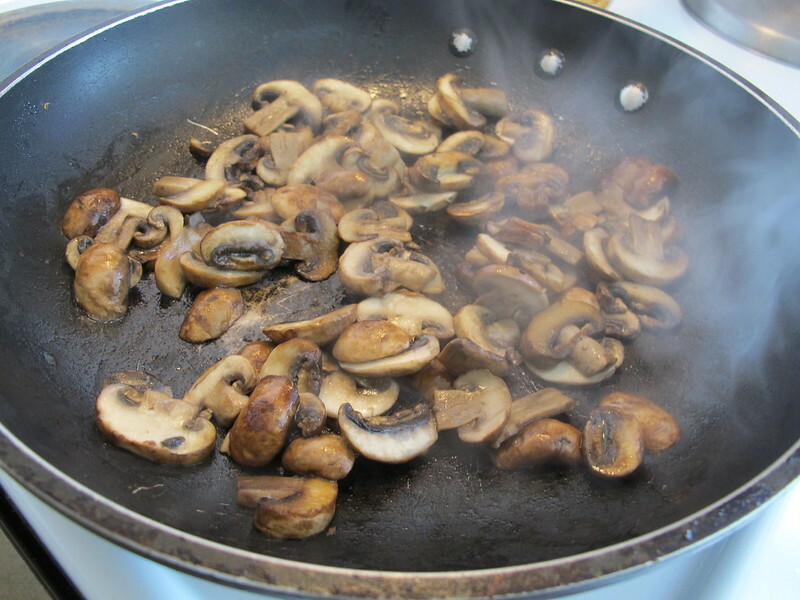 Pull out and brush on more Mushroom Soy, broil another 1-2 mins depending on thickness of salmon. Remove and allow to cool slightly. 8. 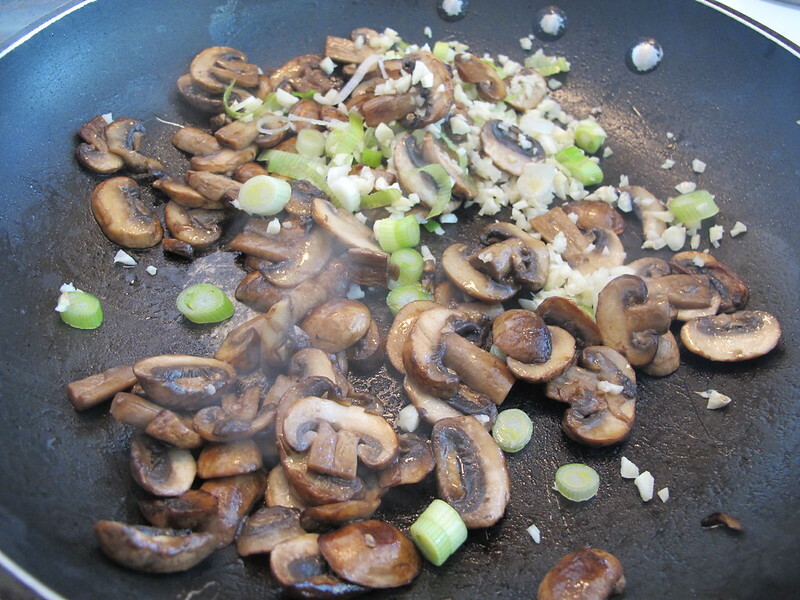 Add remaining 1/2 cup of water to Mushroom Soy, bring to a boil and remove from flames. 9. Let’s assemble the salad! O-M-G are you excited because I am! 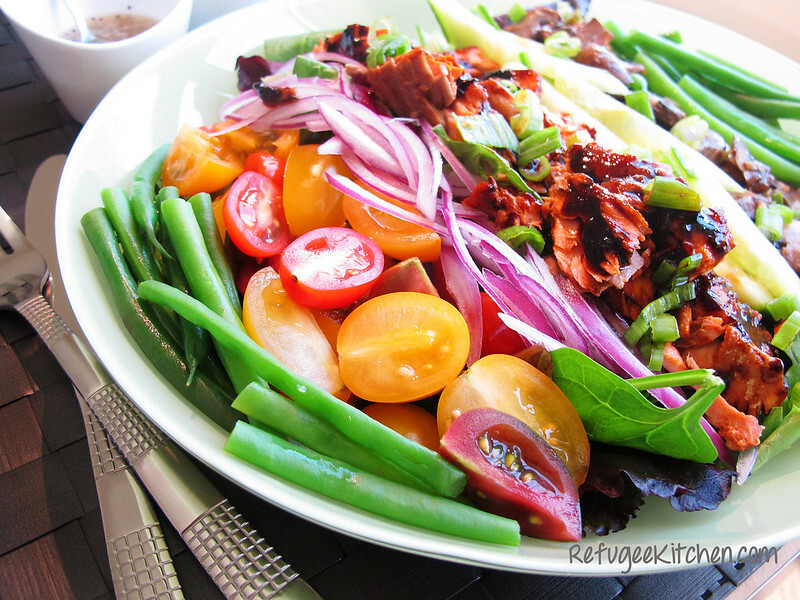 Start with a bed of spring mix, followed by all the veggies. 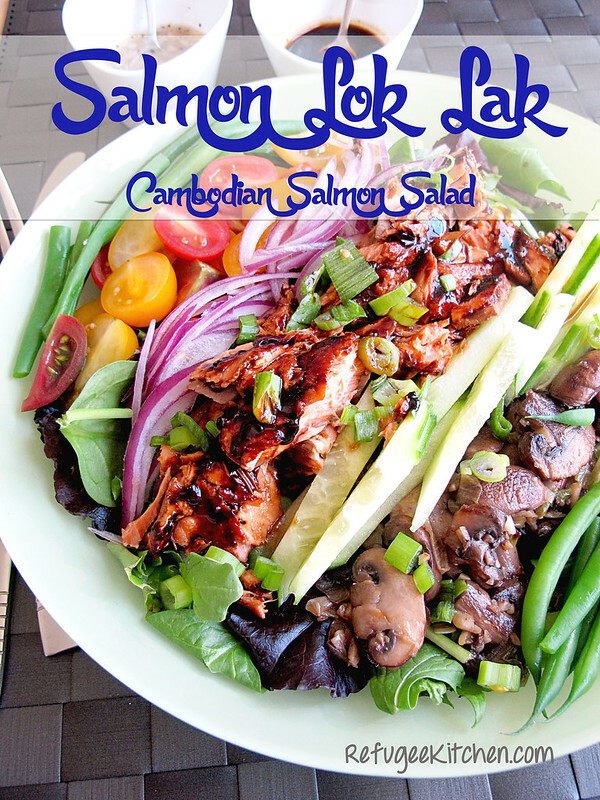 Top salad with salmon, whole or flaked and thinly sliced scallion greens. 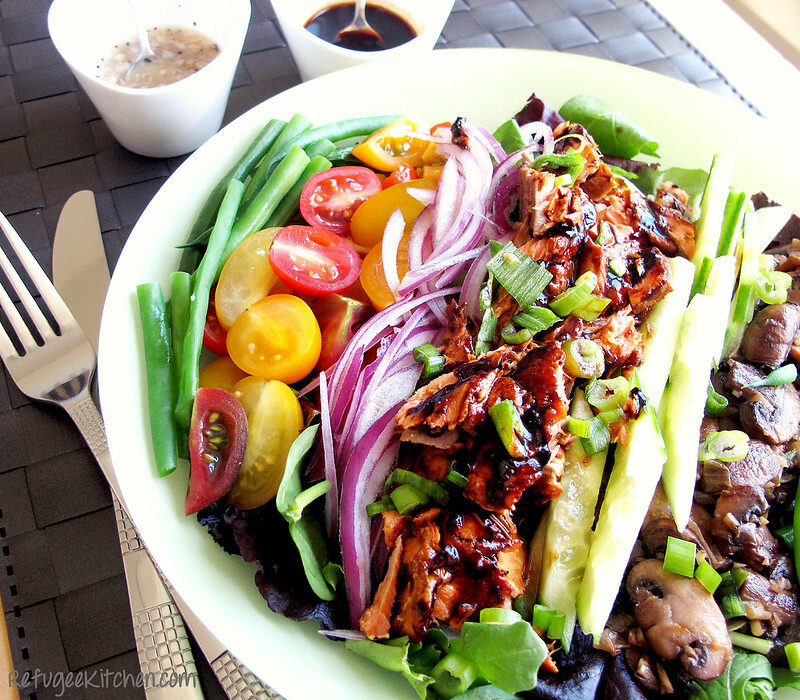 Serve with Lime Pepper Sauce and more Mushroom Soy Reduction on the side. I like to first drizzle on the hot Mushroom Soy, toss it lightly then followed by Lime Pepper Sauce on top. YUM!!! Continuing my countdown to Khmer New Year’s fun, another song! My sister, mother and I have decided on which parties to attend and can’t wait to get our feet moving on the dance floor. Oh gosh.. what to wear.. what to wear!??? ?